Opening the show with the moody, haunting “Lit Me Up,” Science Fiction’s very first track, the theatre was nearly pitch-black, a darkness which was aided by the cage. As the chorus began, red lights resembling flames flickered across a deep green background, floating up into the air only to fall back down like water from a fountain. Later, the image of a moon and trees was revealed from behind the cage. 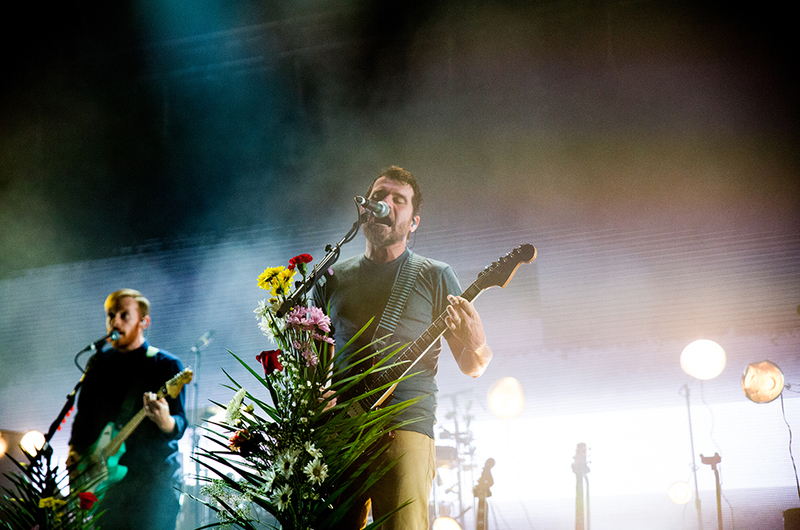 “It lit me up like a rag soaked in gasoline,” frontman Jesse Lacey sang before breaking into the second song, appropriately titled “Gasoline,” off 2009’s Daisy. A loud, hard song, it served as a musical foil to the softer slowness of “Lit Me Up” and immediately pumped up the crowd. Still encaged, the lights then went up and burst into strobe-like stripes against the screen for their third song, also off Science Fiction, “Out of Mana.” During the song’s last minute, the cage was lifted and the band was suddenly in full view, earning cheers and screams of surprise and relief. Finally the wait was over, and there they were: visible and freed from their self-imposed shackles. The show had officially begun. Playing fan-favorites in-between songs of Science Fiction, such as “Sic Transit Gloria,” “Degausser,” At The Bottom,” and “Sowing Season,” the set not only introduced the new material, but triumphantly honored the old. However, there were more telling, sometimes unsettling moments. During songs such as “137,” the images on screen became a bit darker with an eerie familiarity to them, yet still serving to perfectly complement the song. With a nursery rhyme-esque chorus, Lacey adopts a singsong voice when he suggests, “let’s all go play Nagasaki, we can all get vaporized.” Visuals of the atomic bomb appeared, a reminder of what not only happened in the past, but what is currently happening in the present. Kevin Devine, a close friend of the band and excellent musician in his own right, made his first appearance with Brand New, singing background vocals and playing a third guitar. Though he stood slightly back from the rest of the band, he made his presence known, punctuating the set with his characteristic leaps, buoyantly bobbing up and down like an undulating wave of pure force, seemingly spending more time flying through the air than standing on the ground. The band immediately responded, enthusiastically joining in. Brand New, a group of musicians who always put on a striking performance, hasn’t been this dynamic live in a long time; Devine’s contributions revitalized the band’s performance, his energy a tough match to follow. Devine also just released a new record that can be found on Procrastinate! Music Traitors, entitled We Are Who We’ve Always Been. During a poignant encore consisting entirely of one song, “Soco Amaretto Lime,” Lacey emerged with an acoustic guitar, the only figure on stage under the yellowish glow of a dim spotlight. “Passed out on the overpass,” he began, playing the last song off Brand New’s first record, Your Favorite Weapon. With 2018 fast approaching, and the band’s eventual demise nearing, Brand New is going out at the top of their game. And maybe, just maybe—we can pray for a not-too-distant resurrection.